Lake Eyre is the largest salt lake in Australia. This lake is actually comprised of two different lakes which are Lake Eyre North and Lake Eyre South. Both of them are connected by a thin body of water called the Goyder Channel which is 15 kilometers long. The basin of this lake covers an area of more than one million square kilometers. It is located in a very dry section of the country and it often has very little water in it. The water in the lake is even saltier than the water in oceans. 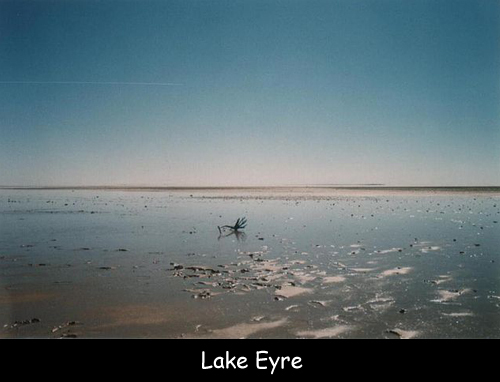 The Lake was named after the English Explorer Edward John Eyre in 1840. He was the first outsider to see the lake and the British ruled the country at that time and they named the lake after him. The original name of Lake Eyre is ‘Kati Thanda’, given by the local Arabuna People. The area around the lake was inhabited by the Arabuna People. The Lake Eyre National Park was established in 1985. There is no public access to this area. Anna Creek is the largest cattle station in the country and it is located on the south-eastern side of this lake. The lake is Australia’s lowest point with 15.2 meters below sea level in Belt Bay and Madigan Gulf. It is normally dry and it fills completely only an average of twice in about hundred years. This happens because of the high evaporation rates in the region. It is also the fourth largest terminal lake in the world. Declan, Tobin. " Amazing Lake Eyre Facts for Kids ." Easy Science for Kids, Apr 2019. Web. 26 Apr 2019. < https://easyscienceforkids.com/lake-eyre/ >.